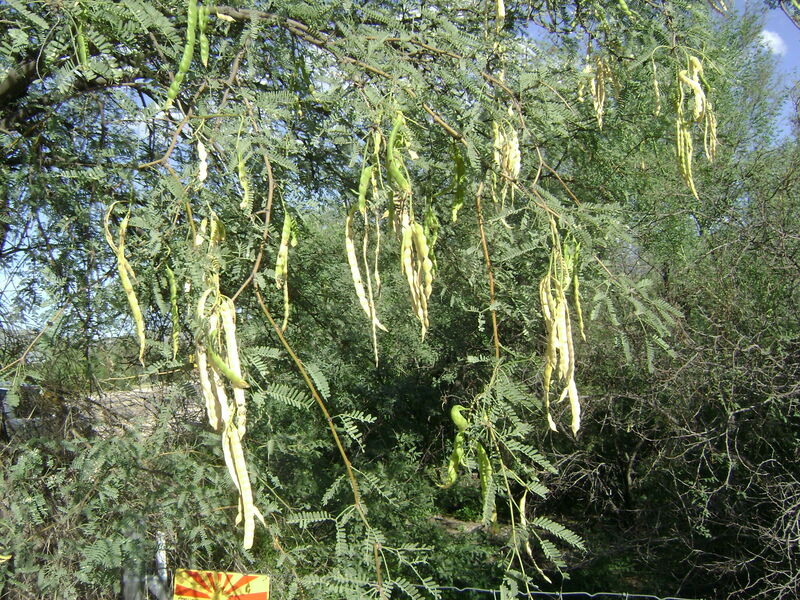 This is your last chance to gather some mesquite pods this season. While all mesquite trees fruit in the summer, some of the native species have a second fruiting in the fall and you’ll still find a few trees that still have pods. My South American mesquites fruit only in June which is fine with me — the pods taste rather chalky, not sweet like the natives, so I don’t gather them. In Southern Arizona, we are lucky that come November, Desert Harvesters will haul out their hammer mills and grind mesquite pods for a very modest fee. When I first started gathering mesquite in the very early 1970s, this option didn’t exist. I tried a hand cranked grain mill, but it gummed up quickly. If the pods were very dry, a blender ground everything up, but then it had to be sifted and still the meal was very coarse. The hammer mill automatically grinds everything up, sifts out the unuseable fiber, and produces a product that is as fine as whole wheat pastry flour. It also grinds up the true seed where the protein is located. I will post the Desert Harvesters schedule when it comes out. Stored mesquite pods frequently have holes in them where the bruchid beetles have eaten their way out. If you want to avoid the holes, freeze the pods. I’ve also heard that microwaving them works as well. 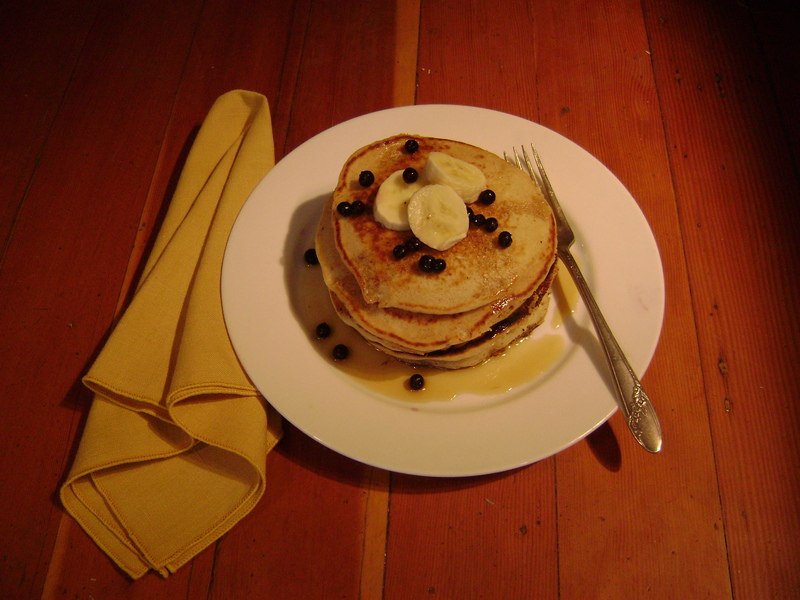 Once you have your delicious mesquite meal, you can try adding a quarter cup of mesquite meal to your favorite pancake recipe. You bring up a good point. First, let us be clear that we are eating many more insects than we realize. The FDA requirements allow what might appear to be an astonishing number of “insect parts” per whatever. Humans have been eating insects for our entire history and it hasn’t hurt us. In fact, one might say that eating the ground up brucids adds protein to our diet. But if the “eewhu” factor is just too much for you, do as Brad Lancaster (Desert Harvesters guru) does, and put your mesquite pods outside until all the bruchids have burrowed their way out and flown off. You’ll want to do this outside, not in a shed or closet, you want the critters to be able to escape. It would be great to have some real research on this, but since Pillsbury doesn’t stand much chance to make millions off mesquite, we’ll have to wait until some enterprising grad student takes up the project. Did you see my previous comment, about no fruit on my p. pears…I may have already sent my query! Thanks for a response…. It is the tail end of prickly pear season, just a few red fruits remaining on the Engelman prickly pears. The ones in your yard are the Ficus Indica, they have different, earlier fruits, but they are best for the pads, the nopales. NIce blog. Speaking of prickly pears…they’re all over my property but no fruit…what’s the deal?